At the state level, Bosnia and Herzegovina Demining Law regulates Demining Commission as a central body responsible for the conduction of mine action activities and removal of mine danger in Bosnia and Herzegovina. Commission is a part of BH Ministry of Civil Affairs and consists of three members (three constitutive nations). BHMAC as a technical body of Demining Commission is established by the Ministry Council decision in 2002. 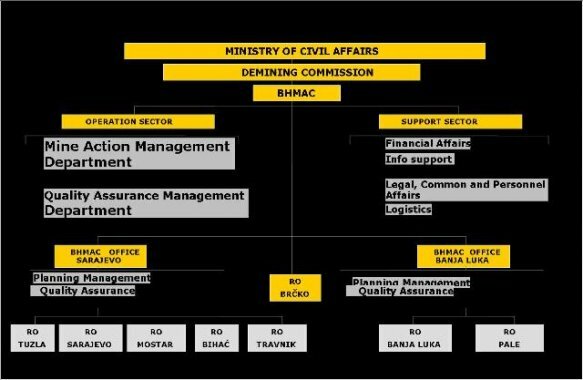 BHMAC has central and two main offices (Sarajevo and Banja Luka) and 8 Regional Offices established across the country (Sarajevo, Banja Luka, Pale, Tuzla, Brčko, Mostar, Travnik and Bihać) allowing operational activities to be carried out locally. Their main tasks are location and marking of suspect areas and database daily inputs. The current structure is funded by BH State Budget. BHMAC main responsibilities are location of suspect areas and its declaration as risk or no obvious risk areas. Areas declared as risk areas are further processed by BHMAC and mine action projects are made for those areas. Demining activities are conducted by accredited demining organizations. Main number od demining projects are going through biddding procedures-ITF tenders (www.itf-fund.si). ITF organizes tenders where all accredited organizations apply. Evaluation Commisssion for Tender procedures is appointed by the Demining Commission in order to ensure its transparency. Evaluation members are BHMAC, ITF and donor country representatives. Apart from organizations who get the job going through bidding procedures, there are also 2 foreign NGO (NPA-Norwegian People Aid and MAG) are financed directly by their own allocations. BH Army is funded from the BH Government budget, while funds for Civil Protections (Federal,RS and Brčko District) are allocated on entity levels. Apart from planning and acreditation of people and equipment, BHMAC conducts technical inspection over all mine action activities. Within technical inspection, method of random sampling is conducted with the final aim to confirm quality control of cleared area. If there is positive confirmation, BHMAC take over cleared areas and objects from contractor (demining oganization), issues Certificates on cleared areas and gives it on a further use to people. Areas with no confirmation of quality level are returned for repetition. Marking of risk areas along with maintenance of landmines and mine action activities database is also a part of BHMAC daily activities. BHMAC is responsible for the drafting and submission of mine action plans to the Ministry Council on further approval. At the international level, Board of donors assists Demining Commission and BHMAC. Its members are UNDP, OHR and other donor country representatives. Board of Donors sessions are held every 6 months in the Ministry Council building and with Minister of Civil Affairs as Chairperson.